Hello, everybody! I’ve missed you, and missed writing to you, but it has been GOGOGO here and I’ve found it hard to stop, think, and write. Whew! Let’s give it a try, though, because I have such pretty things to show you! Early last week, in the midst of my sewing-planning-todoing frenzy, my partner reminded me that we were scheduled for a 2-day trip to Portland. We’d booked this a couple of months ago around a work-related seminar that he wanted to attend, and I had completely forgotten about it. Not an optimal time to be away from the sewing machine, but okay. But then I checked where we were staying and discovered it was a walkable distance from SCRAP PDX! Yep, let’s go! So Friday morning, he went off to learn things, and I went off to find the Motherlode of Random, SCRAP PDX. I didn’t remember to take pictures, but what a fun store! Leather scraps! Plastic glasses frames! More buttons than you knew existed! I think the one on the left is rayon; then there’s eyelet, some quilting fabric, and another yard of green fleece (I already have two remnants of this fabric). It was labeled “Matisse panel,” so I immediately thought of quilt possibilities, but it’s actually a knit. The selvage says “Matisse in Morocco” and if this isn’t summer captured in a fabric, I don’t know what is. A small portion of the bag, all washed and ready to go. So that’s all my future sewing. Let’s see how I’m doing on my current sewing projects. The cycling jersey is coming together. I had hoped for a fitting session this morning, but the Resident Supermodel dashed off early . . . . He wanted the pockets to be different sizes, and I honestly thought it wasn’t going to work, but I love this! The blue one is just perfectly sized for his phone, and deep enough so that it won’t fall out. I had all kinds of problems with the front zipper on this, all of them completely my fault. I have this frankly terrible habit of coming up with an idea on how to do something, not thinking through the whole process, and just figuring I can make it work somehow. On the one hand, it’s great that I’ve got some confidence in my own sewing skills (finally); on the other, every time I do it, I’m aware that one of these days I’m totally going to sew myself into a corner, probably using the world’s most expensive fabric. That didn’t happen here, but I did spend a lot of time I didn’t have making that zipper installation work. All that’s left to do is side seams, hems, finishing the collar, and redoing the front pocket–I have been informed that it needs to be half an inch deeper. 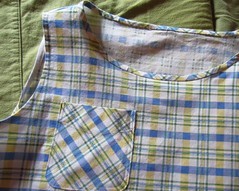 There was some mention of how nice it would be if that pocket had a zipper, but I quickly shut that ALL THE WAY DOWN. No adding items to my to-do list at this late date! Also, the hoodie is ready to go! Yes, I do look a little bit like an extra from “Lord of the Rings,” but I’m okay with that. A bit of a fiddly project. There’s some sort of problem with the pockets–the pieces don’t fit together the way they should. I more or less forced them together, but it was another time-waster and a bit of a dispiriting way to start a new project. And the instructions have you cut strips of your fabric, press under the long ends, and sew the strips over the seam edges on the hood, neckline, and front facing. I do love me a nice, neat seam finish, but this kind of finish isn’t that easy to do on a knit that doesn’t press well; if I had it to do over, I would probably hunt down some wide braid and use that on the seams instead. 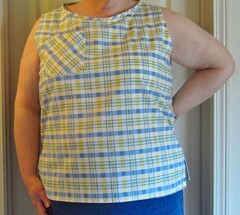 I suspect the lesson to be learned from this project is to not take on a Vogue pattern when time is short. This was my first time working with ponte, and it was a lot less stable than I expected. I keep hearing how easy ponte is to work with because it doesn’t stretch much, but this poly/rayon/Lycra ponte from Girl Charlee felt like a heavy, stretchy jersey (and had all the challenges associated with that). Whining aside, I do love how this came out, though. Instead of the sensible 3/4″-1″ buttons called for, I used these nifty 1 1/4″ buttons and put big snaps underneath. The hoodie is very comfy and cozy to wear, and I’m sure I’ll get plenty of use out of it, so that’s the important thing. Okay, that’s it for now. We’re off on Monday and won’t be back until August 12th. I’m going to see if I can post some pictures as we go along. Either way, I’ll be back mid-August with more pictures of the UK than you ever wanted to see. I hope you’re all planning some summer adventures of your own. Take good care of yourselves, make something that you love, and go sit in the sun when you can. I CAN FEEL THE EYES UPON ME . . . .
Friday night was another Friday Night With Friends, so I got busy with my pliers and zipper repair kit and put new top stops on my partner’s fleece cycling jersey zipper. Oh, how I labored over that zipper! I wasn’t able to find a repair kit for the kind of big chunky zipper I’ve got in here (I don’t know the correct name for this type, but it’s the kind that’s labeled as a “parka” zipper), so I ordered the #5 kit and hoped for the best. As I feared, the only way to get the stops on was to put them parallel to the edge of the tape, rather than parallel to the teeth as they usually are. They seem secure enough, though, and I sewed a stop with thread below them just to be sure. He also wanted the back pocket extended a bit on both sides so that he wouldn’t have to reach so far to access it. BTW, getting better results when photographing black things by putting them on a darker background, overexposing them, then darkening the pic as needed. Would be even better with a model in it, but he is busy napping at the moment. The ends of the pocket are supposed to be enclosed in the side back seams there, but I’ve extended them a few inches and just sewed the raw edges down. He also asked me to change the way the elastic is attached to the wrists of the jersey so that it would be fully enclosed. Jalie’s method for attaching elastic is to have you zig zag it directly onto the raw edge of the fabric on the wrong side; then you fold the raw edge under and zig zag again. The problem is that the edge of the elastic inevitably sticks out a bit and can irritate your skin. So I simply added 1/2″ to the sleeve length and folded the edge under twice before zig zagging. I’m very happy to say that this version of the jersey came out infinitely better than the first one, and much better than the second. The recipient loves it, I’m happy with my work on it, I actually got it done BEFORE the season in which it will be worn, AND I had enough black fleece left over to use it for the hood on my Hello Kitty pullover. WIN. 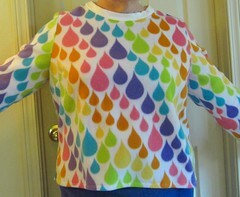 Also, I finished the pullover yesterday–I AM WEARING IT NOW–and will get pics for you ASAP. SO VERY FABULOUS, my friends. Have a very excellent week, folks, and I will yell at you again soon.